Chic multi-talent. 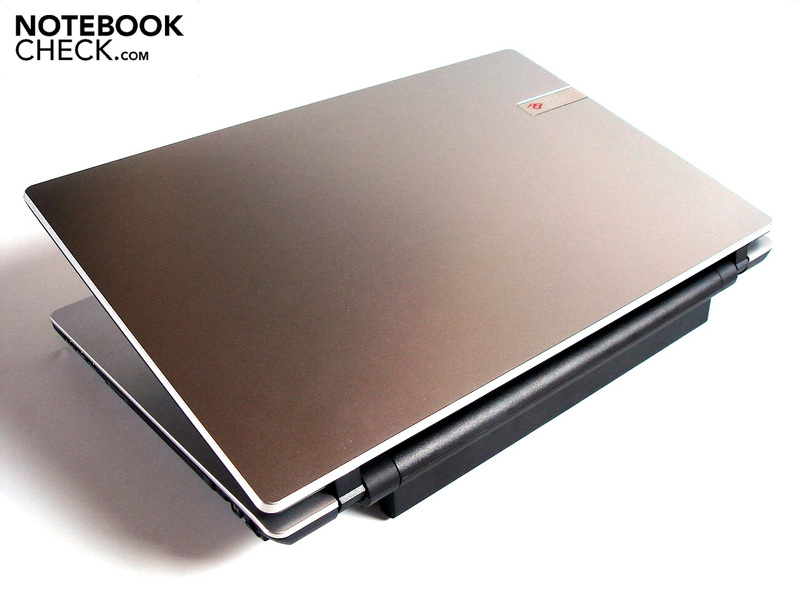 Packard Bell is skilled at offering notebooks with an excellent price-performance ratio. 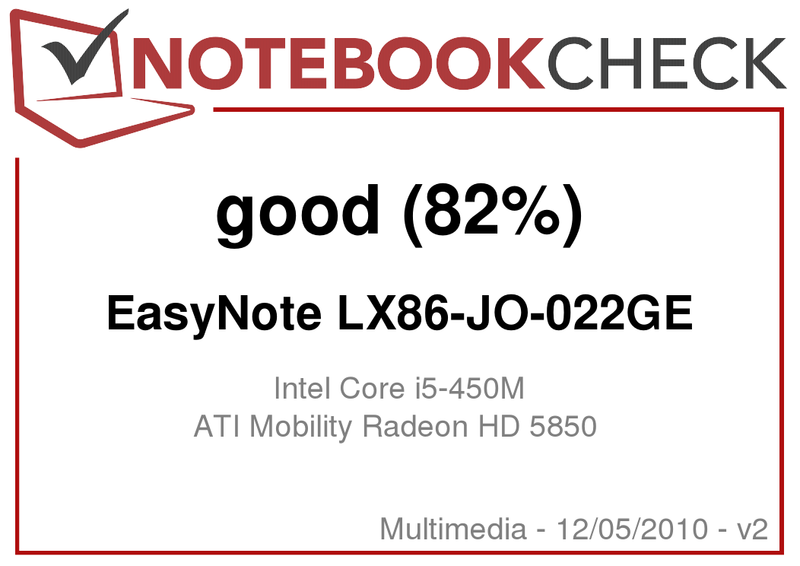 The 17" EasyNote LX98 represents the best proof of that; after all, it's not every day that you find a Radeon HD 5850 and a Blue-ray burner for just 1000 Euros. Packard Bell, a daughter company of Acer, currently has four variants of the EasyNote LX86 on offer on its German Homepage. The so-called "JO" models represent the entry level offering. In addition to four GB of DDR3 memory (2x 2048 MB), a 500 GB HDD (5400 rpm) and a DVD burner, these are also equipped with a six-cell battery (4400 mAh). Depending on the model, the processor employed is either a i5-450M (JO-027GE) or a Core i5-460M (JO-069GE). Meanwhile those with more money in their pockets can reach for the more expensive "JP" models. 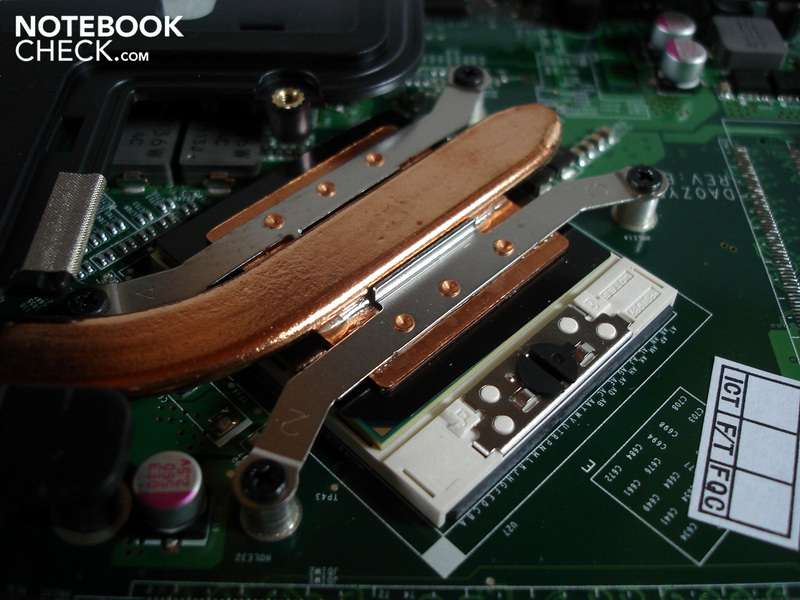 Here Packard Bell not only doubled the amount of memory from four to eight GB (2x 4096 MB) but also the harddrive capacity from 500 GB to a generous full TB (2x 500 GB). Further equipment features include a Blu-Ray burner, a powerful nine-cell battery (9000 mAh) and a quad-core processor. 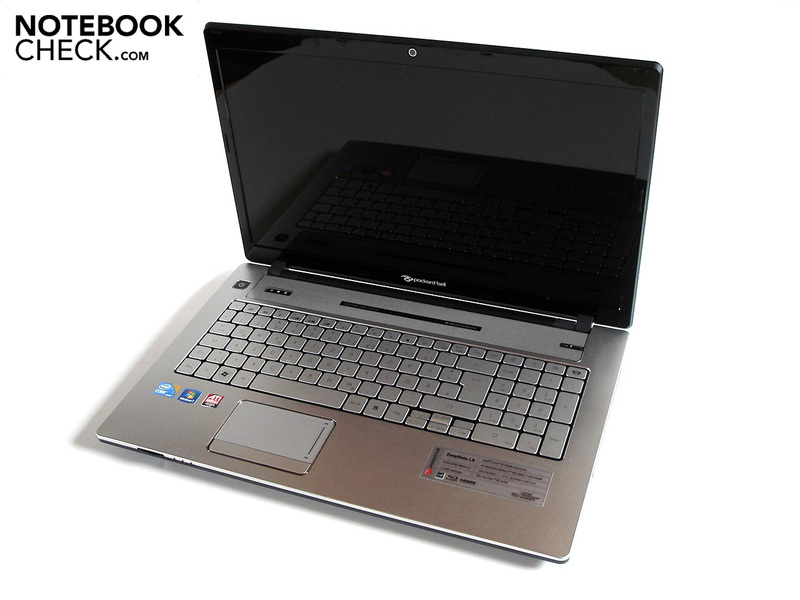 While the JP-050GE gets a Core i7-720QM, the JP-075GE employs a Core i7-740QM. As far as we know, the JO-022GE we reviewed is currently only available from the dealer chain Saturn. With a Core i5-450M, four GB DDR3-RAM, a 500 GB HDD, a Blu-Ray burner and a nine-cell battery, it is a kind of hybrid of the previously mentioned models. Matter of expense: 999 Euro. 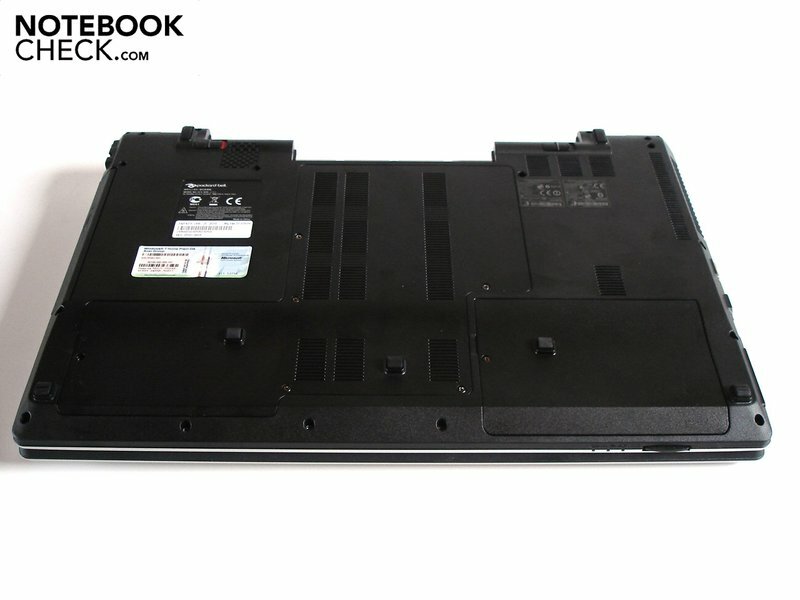 The case is a slightly modified form, which is no stranger after all; Packard Bell simply helped themselves to the Acer Aspire 7745G. Packard Bell did a good job with the optical design of the EasyNote LX86. 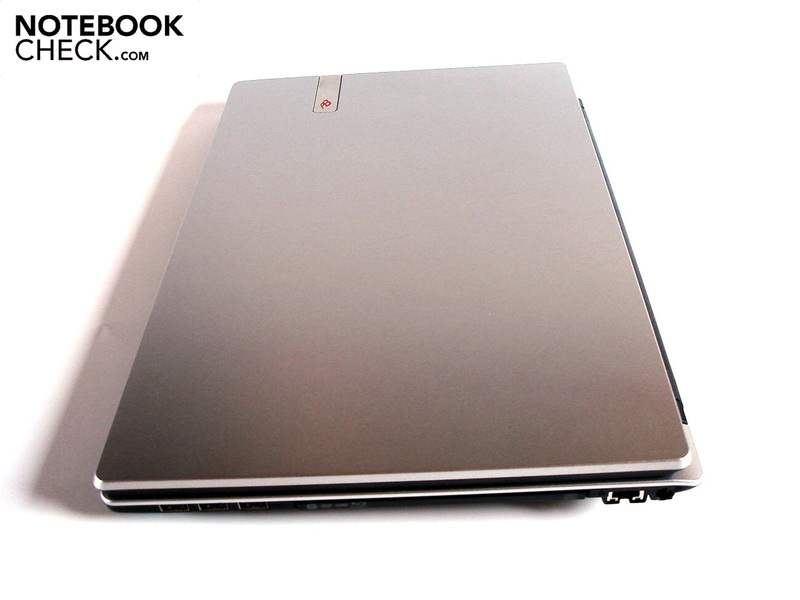 Most of the surfaces are kept in matte silver which imparts the 17-incher with a fresh and fine appearance. Stylish elements such as the large speaker grill above the keyboard go a step further to help give the EasyNote LX86 a chic optical appearance. 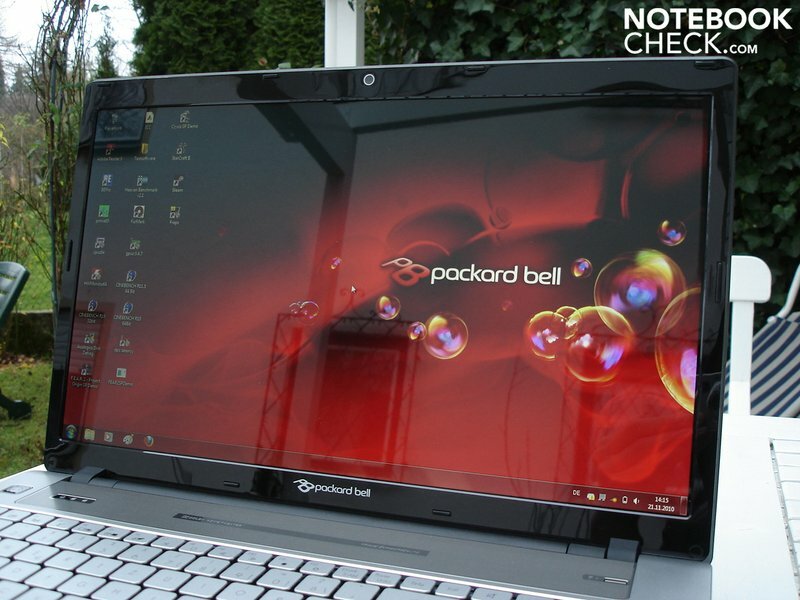 It's clear as soon as one touches its surfaces that Packard Bell relied only on plastic, and not on high-quality aluminum. However, we still got a nice impression from the material. Thanks to a moderate weight of around three kilograms (incl. battery), the 410 x 278 x 56 mm notebook can also be transported reasonably well. A further plus is its high resistance to dirt, as the case is relatively impervious apart from the high-gloss display frame. 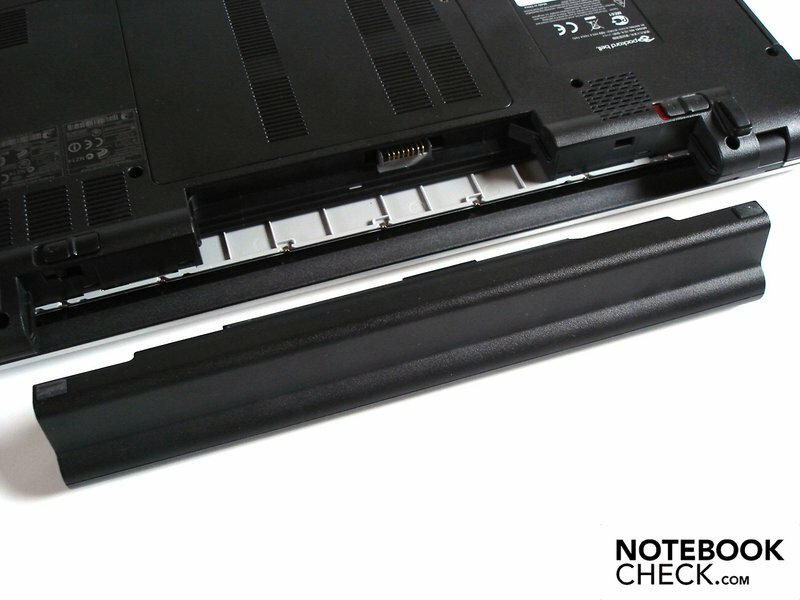 The EasyNote LX86 also doesn't leave much room for criticism in terms of its finish; every part sits neatly in place. But we couldn't give it such good marks for stability. 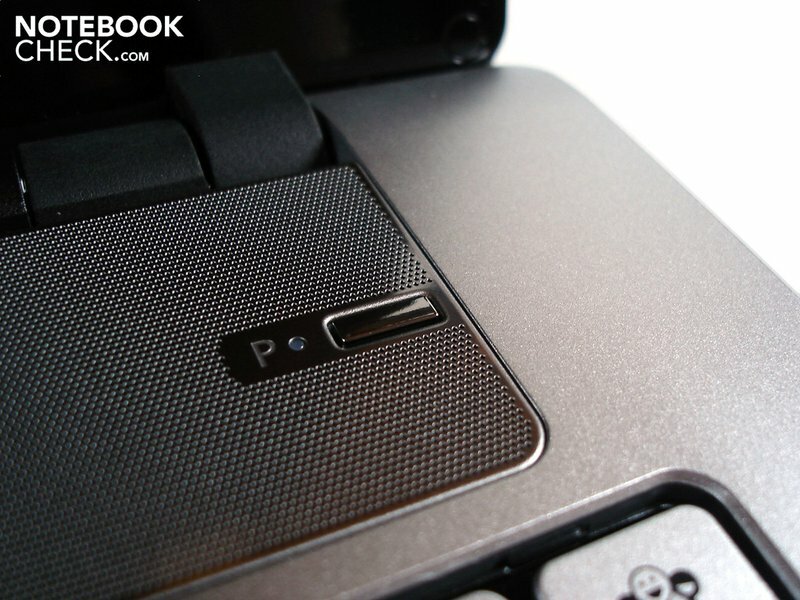 The upper side of the notebook gives noticeably both around the level of the touchpad and the level of the optical drive. The notebook lid doesn't fare much better; it is alarming how much it can be bent, and strong pressure leads, among other things, to image distortions. The hinges also aren't optimal. For one, the display wobbles noticeably when the resting surface is shaken, and for another, the chassis resonates heavily when opening. 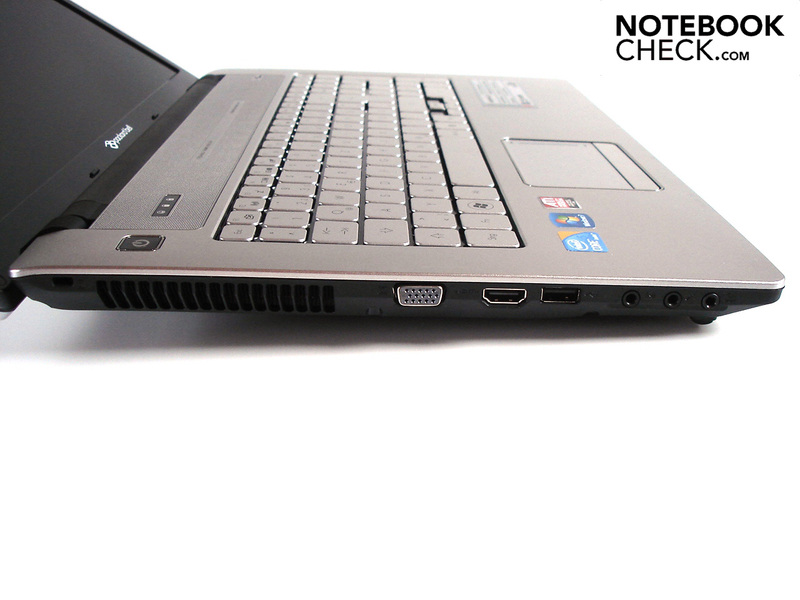 The connection equipment of the EasyNote LX86 corresponds 100% to that of the Acer Aspire 7745G. That's a shame as that means the user has to do without numerous connections. In addition to there being no ExpressCard slot, there also aren't any ports for Firewire and eSATA. Most of the interfaces available are housed on the left side. Here we find a VGA-corresponding HDMI port (microphone, headset, line-in), a USB 2.0 port and as a Kensington lock. Found on the front side is only a multi-in-1-card reader, while the rear remains completely free. The right side on the other hand is better kitted out with three additional USB 2.0 ports (a total of 4x USB 2.0). 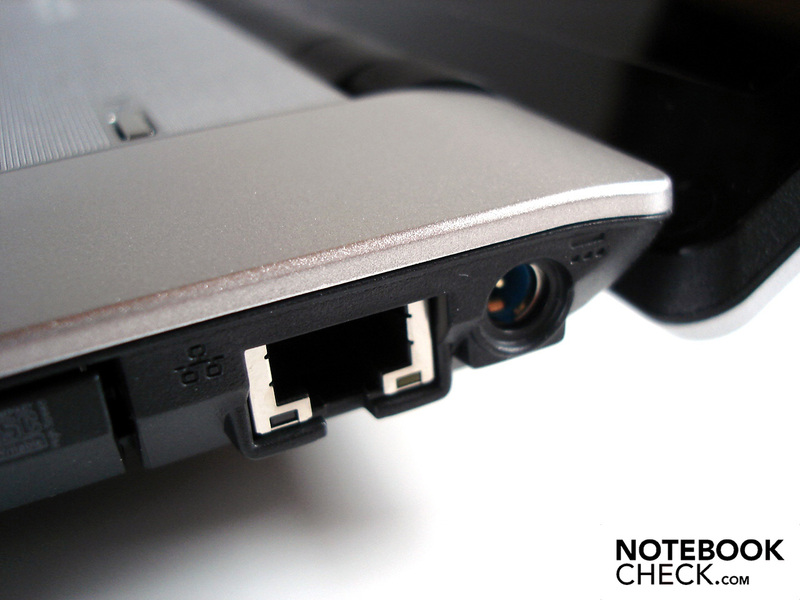 Rounding off are a RJ-45 Gigabit-Lan port and the power supply input. We consider the arrangement of the connections to be entirely unsuccessful. 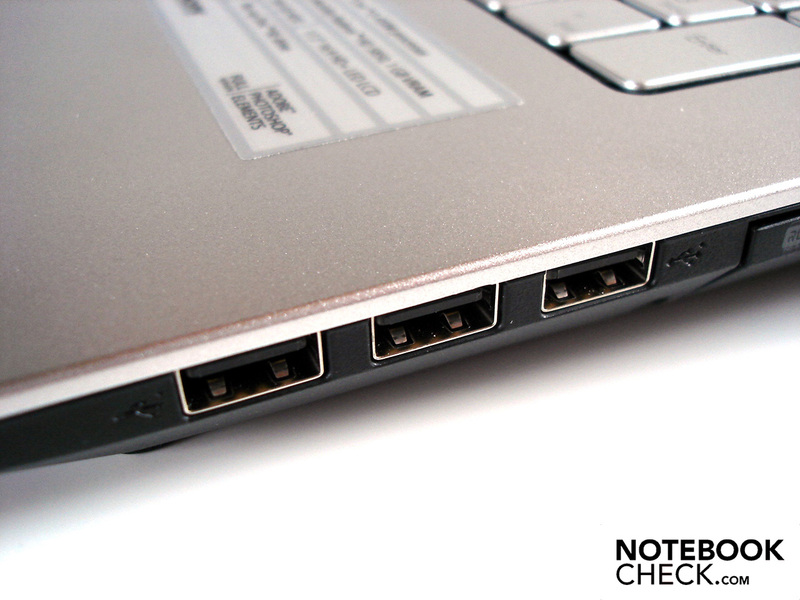 Since most connection options sit far forward, available space to the side of the notebook suffers greatly when several cables are plugged in. Using a mouse can lead to problems. There is nothing to fault about the wireless communication. With WLAN (802.11 b/g/n) and Bluetooth (Version 3.0), all possibilities are open for the user. 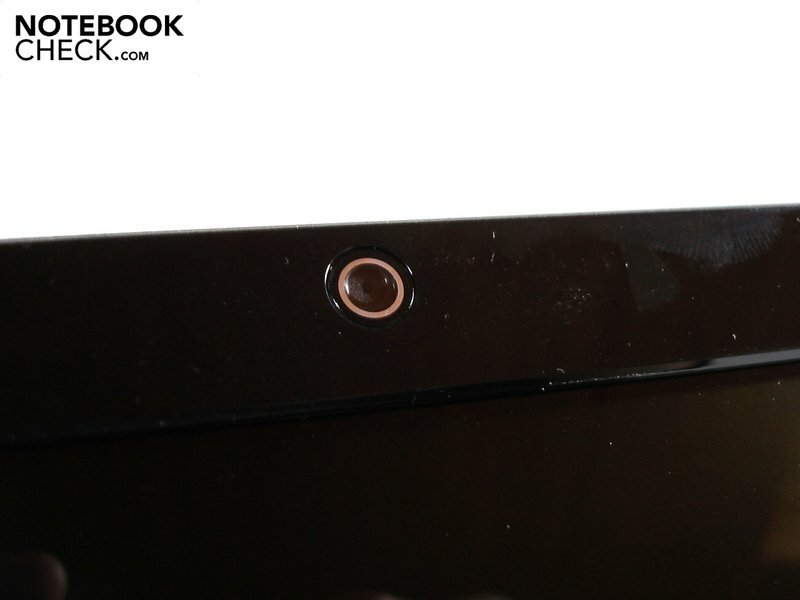 Apart from that, the EasyNote LX86 also gets an integrated webcam with a resolution of 1.3 mega-pixels. 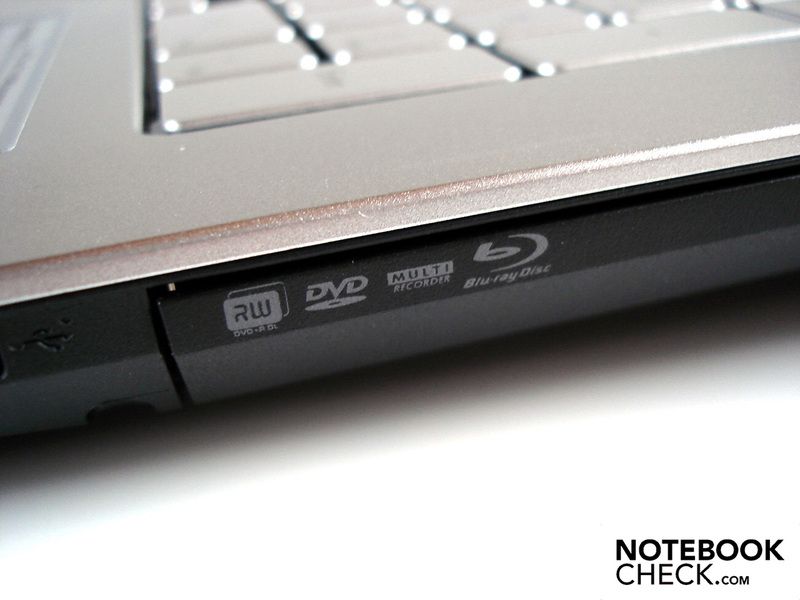 But the highlight of the multimedia notebook is the optical drive, an honest-to-goodness Blu-Ray burner brings delight to both film-fans and users of large quantities of data. Like most of the large manufacturers (Sony, Asus, Acer, Toshiba etc. ), Packard Bell didn't exactly hold back on the software installations. Therefore in addition to numerous company programs, the deinstallation process also entails getting rid of a diverse mass of bloatware. Due to the annoying pop-up messages, a reduced operating speed and delayed booting routine, it is advisable to carry out a deinstallation of the associated software directly after start-up. Packard Bell makes up some ground in terms of the the delivery contents. Though the manufacturer (as is typical by now) doesn't include any original data medium with the operating system (Windows 7 Home Premium 64bit), three blank DVDs do help in creating a recovery medium. A cleaning cloth and a Blu-Ray-disk with its own trailers also aren't typically a given. 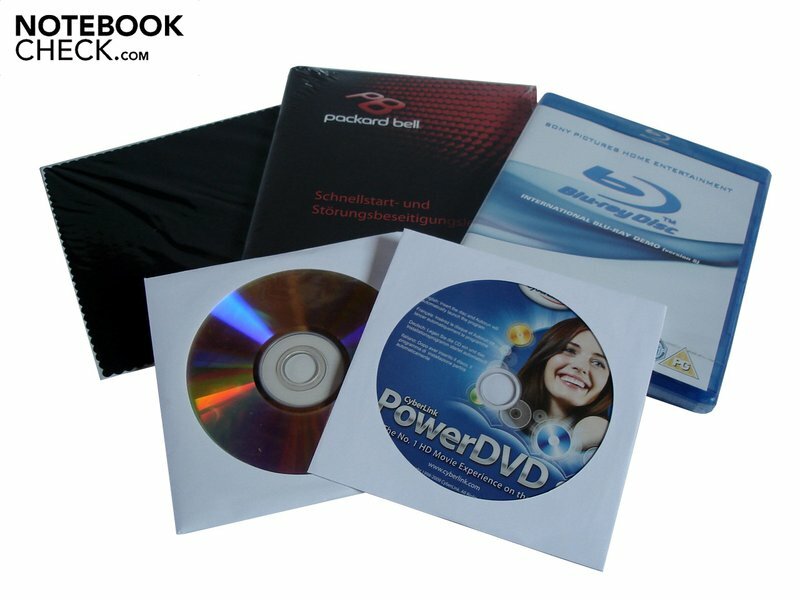 In order to enjoy Blu-Ray-films without additional at-cost software, the EasyNote LX86 also gets PowerDVD 9 from CyberLink. 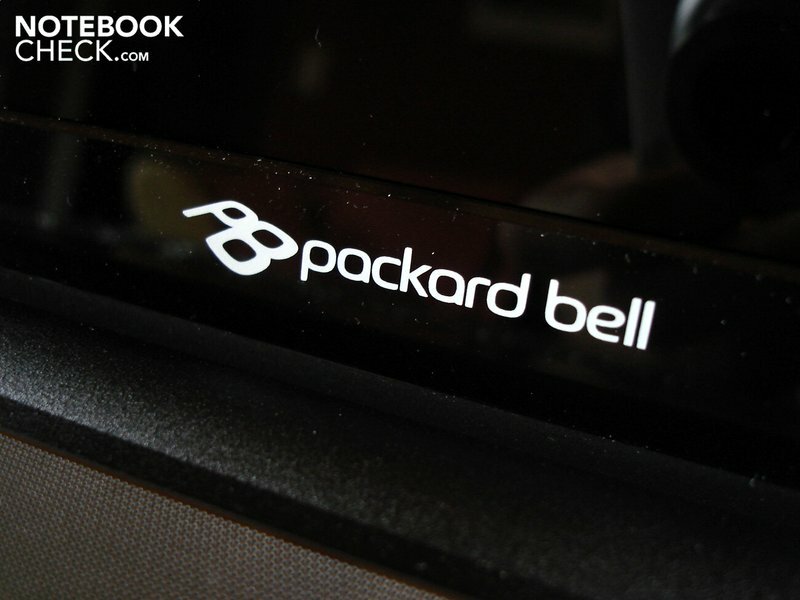 Packard Bell grants its customers a 24 month guarantee, and the Collect & Return service simplifies this process. Those who write a great deal may not be too happy with the keyboard on the EasyNote LX86. The typing feel turns out to be relatively spongy. Pressure points and stroke are not defined enough. Furthermore, the space between the keys (~2mm) could be larger, as we were often catching multiple keys in the practice test. This is compounded by poorly-contrasted marking as well as a slightly cheap-sounding typing noise, all of which further emphasizes the negative impression. Yet some aspects do in fact save the keyboard from a worse rating. The layout for instance is thoroughly successful and the dedicated numeric keypad helps when quickly putting in numbers. The size of the keys (16 x 16 mm), apart from the very thin arrow keys, is also decent. As compensation for the mediocre keyboard, the user is offered an outstanding touchpad which just about sets new standards. 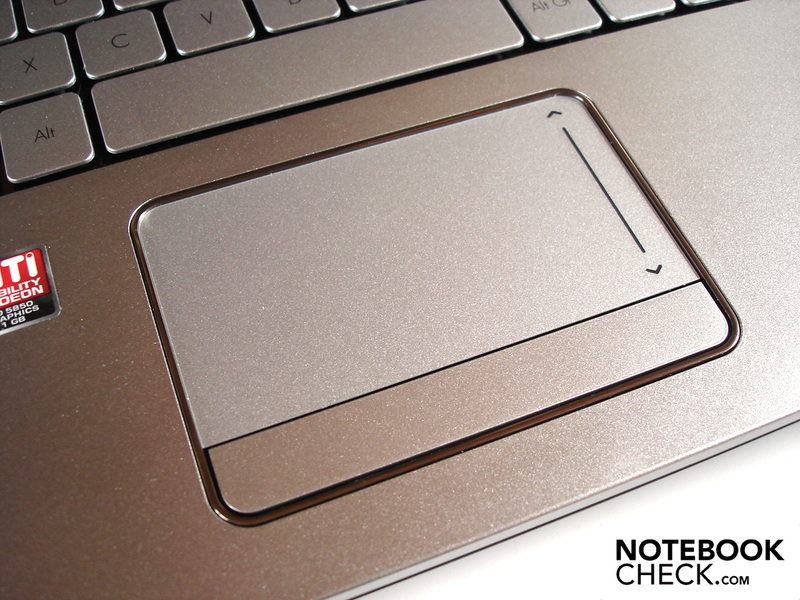 For one thing, the deactivatable and exceptionally precise touchpad is perfectly dimensioned at 90 x 50 mm. For another, the pleasantly smooth surface provides it with good gliding characteristics, while its slight depression also guarantees a modicum of orientation. The rest of the touchpad's characteristics are also impressive: The scrolling function performs just as well as the multi-gesture-control. The crisply triggering keys, which are combined into a single bar, are the icing on the cake. 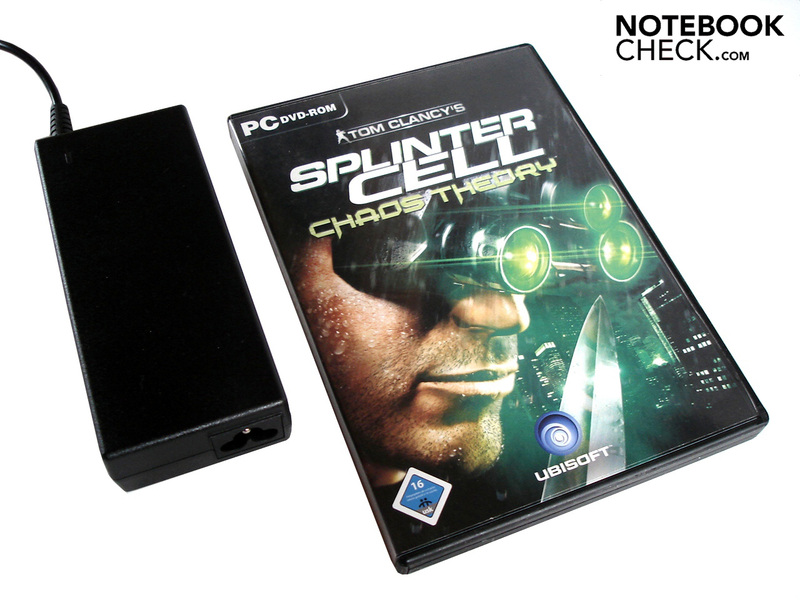 The positioning is the only thing which may perhaps dissatisfy gamers, as there is always the risk of key errors. The 17.3" display deserves to be described as standard-fare. A resolution of 1600x900 pixel offers a good compromise between resource demands and picture surface, meaning that working with two open windows side-by-side isn't a problem. Furthermore, an aspect ratio of 16:9 ensures that the typical film-bars are reduced; the EasyNote LX86 is a multimedia notebook after all. But, the picture quality of the Chi Mei N1703o6-L02 panel is far removed from that of front-runners like the Hannstar HSD173PUW1 (see for ex. Asus G73JW). Though the colors do make a powerful impression subjectively, the values we got in fact reveal several deficits. The high level of black of 1.0 cd/m² make darker areas seem grayish rather than deep black. While that is hardly noticeable in office use, it makes itself known in a negative way in films or games. The contrast is also anything but outstanding; a scant 217:1 is only partially masked by the high-gloss surface. The luminosity is on a good level thanks in no small part to the LED backlighting. 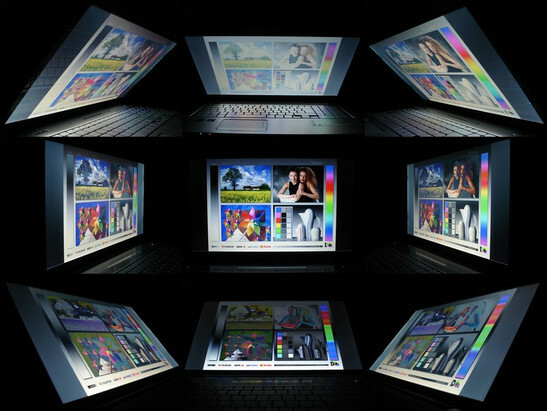 With an average of 212.1 cd/m², the display's projection is adequately bright. A big disadvantage of the glossy display surface is its high suscesptibility to reflections. Especially outdoors, annoying reflections appear under direct or indirect rays of light. Though reflections come up much less often and with less intensity when indoors, one should still make sure they find the optimal positioning (not across or under windows). The greatly limited viewing angles are an additional shortcoming of the display. Both horizontally and vertically, even minimal changes are enough to produce image distortions. Continual adjustments are a daily affair with the EasyNote LX86. The JO-022GE model before us equipped with a Core i5-450M from Intel. The dual-core processor for the current 1156 socket is executed in the modern 32nm process and has a standard clocking speed of 2.40 GHz. As long as the cooling system is up to it and the cores aren't all worked to full capacity, the clocking can even be raised to up to 2.66 GHz through Turbo-Boost technology. The Hyperthreading technology on the other hand is responsible for the simulation of two virtual cores, thereby allowing the Core i5-450M to run four threads simultaneously. While this currently offers no notable advantages for gaming, it has some significant effects in optimized application. Three MB of L3-cache can be considered as a further guarantor for good performance. A special feature of Intel's dual-core CPUs of the Core i3, i5- and i7 series is the presence of a (relatively low-performing) graphics chip called GMA HD. The current consumption of the Core i5-450M is not exactly low at 35 watts, but in addition to the graphics unit, the memory control is also integrated into the processor. We checked the performance of the CPU with the Cinebench benchmark program. As a means of comparison, the Core i5-450M not only had to go up against the popular quad-core Core i7-720QM, but also against the Core i7-620M, which is currently the fastest dual-core going. While the Core i5-450M positioned itself just behind the Core i7-720QM with 3662 vs. 3691 points in the Cinebench R10 (64bit), the Core i7-620M pulled away by around 14% (4181 points). In the Mutlicore-Rendering test (64bit), the Core i7-720QM's greater number of cores allowed it to clearly set itself apart from the dual-cores . With 10000 to 8081 points, the Core i5-420M was outflanked by around 24% (Core i7-620M: 8827 points). For the graphics card, Packard Bell went with the rather seldom Mobility Radeon HD 5850 from ATI. The graphics card, which is capable of supporting DirectX 11 and produced in 40nm, represents a link of sorts between the mid-range (Radeon HD 5650) and the higher level (Radeon HD 5870). With an ample 1040 million transistors (HD 5650: 627 million) and 800 unified shaders (HD 5650: 400 shader), the Radeon HD 5850 contains in principle a great deal of performance potential. But the crux of the matter is the type of memory used. As the memory interface is thinly scrimped at 128bit, the graphics card should have been equipped with a good memory bandwidth with a fast GDDR5-VRAM. Unfortunately like most manufacturers (see for ex. 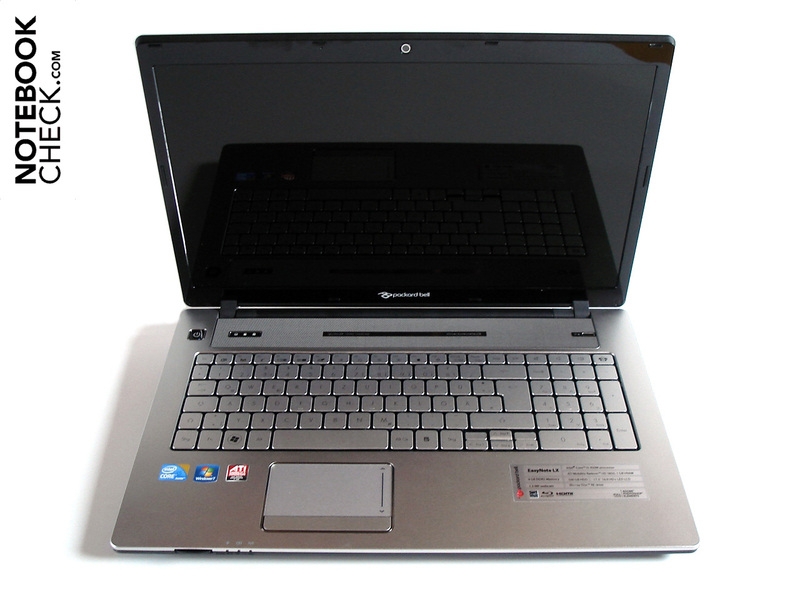 Acer Aspire 7745G, 5943G & 8943G), Packard Bell uses only a DDR3-VRAM, which shows its weakness primarily in higher resolutions and when applying quality improvements. That said, Packard Bell didn't dare to experiment; 625 MHz for the core and 800 MHz for the memory meet the standards. 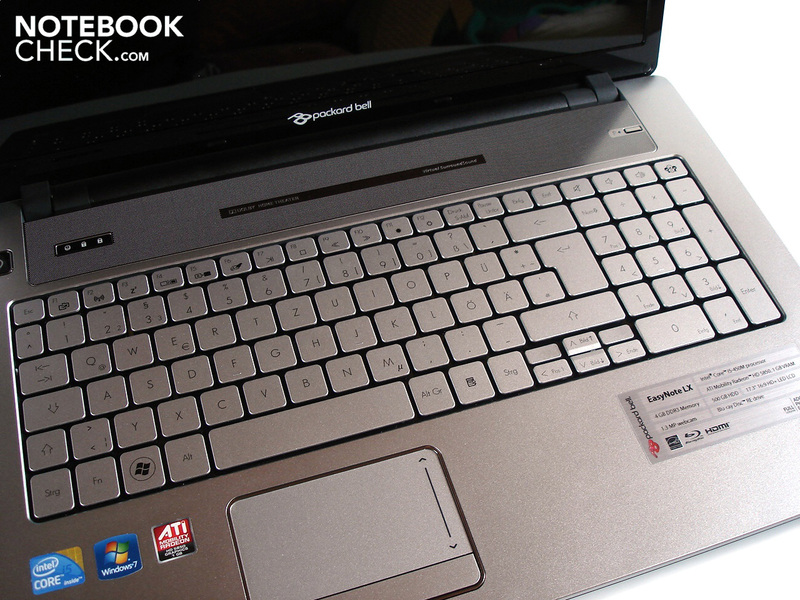 Packard Bell is worthy of praise for using the opportunity at hand and providing the EasyNote LX86 with an option for switching the graphics card ("Switchable Graphics"). Depending on the level of demands, the user can change between the integrated (GMA HD) and the dedicated (Radeon HD 5850) graphics units depending on whether the focus is on battery life, or primarily on performance. In contrast to Nvida's Optimus, Switchable Graphics doesn't work dynamically, but rather through a manual input from the user. The process of switching is conceivably quite simple: Right click on the desktop and choose "configure Switchable Graphics". The process takes only a few seconds. However, changing the GPU is only possible if no applications are open. If for instance one notices that the wrong graphics unit is active only after beginning a PC game, the program must be closed first - inconvenient. The advantage lies in the low dependency on the driver; with the manual functionality, errors are very rare. With the graphics benchmarks we were primarily interested in how the Radeon HD 5850 performs against its mid-range and high-end siblings from in-house. The Radeon HD 5850 cuts a good figure in the 3DMark Vantage, and with 5038 vs. 2737 points (GPU score), the Radeon HD 5650 is left behind by a considerable 84%. The Radeon HD 5870 can't distance itself so significantly from the Radeon HD 5850. With 7584 points, it has a performance advantage of 51%. 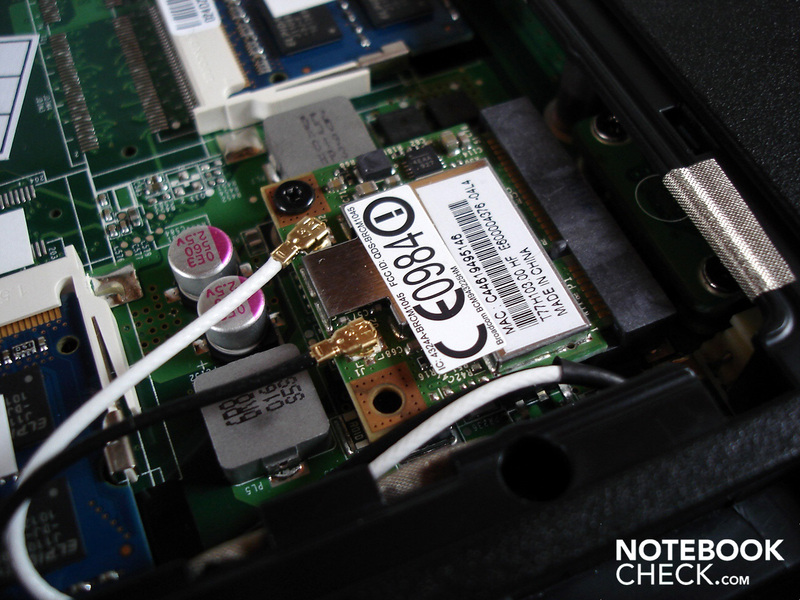 The harddrive in the EasyNote LX86 is a 500 GB HDD from Hitachi. The model marked HTS545050B9A300 was able to show reasonable performance in testing. Due to a rotational speed of 5400 rpm, the average transfer rate of 63.9 MB/sec somewhere in mid-field (HD Tune). A sequental read rate of 75.90 MB/sec. and a sequential write rate of 75.01 MB/sec. can also be described as decent. Intel's Core i5-450M, in combination with ATI's Mobility Radeon HD 5850, ensures gratifyingly-good application performance. The system works nice and quick, even with more demanding applications. Performance bottlenecks are rather seldom. With this package, the user is well equipped for the next few years. Safeguarding the future isn't a foreign concept for the EasyNote LX86. The gaming benchmarks basically entailed a graphics comparison between the Radeon HD 5850 and HD 5650. 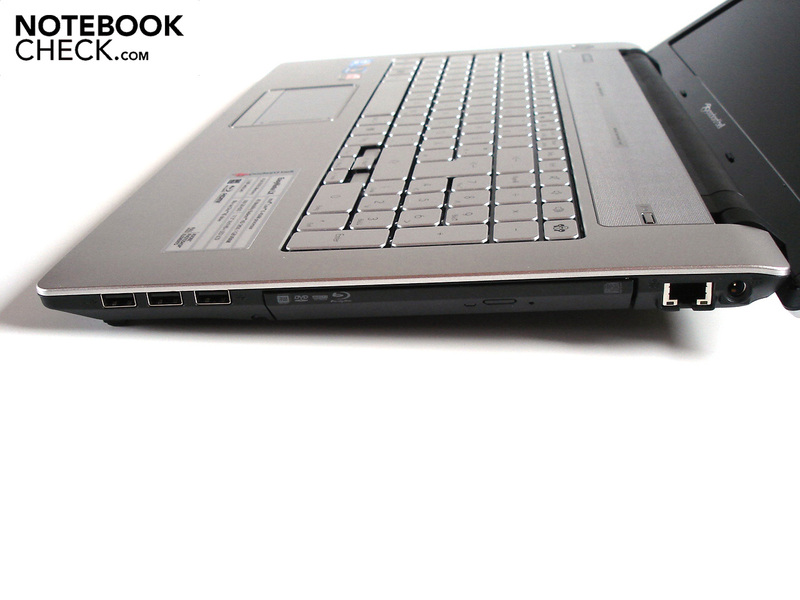 The Acer TravelMate 7740G and the Acer Aspire 4820TG serve as the basis for this comparison. Our indicate of whether the performance difference justifies reaching for the Radeon HD 5850. The gangster-myth Mafia 2 doesn't cause any fuss for the Radeon HD 5850, even in higher resolutions and quality settings. With high details and 16x AF, we could measure a decent 29.3 fps in the 1920 x 1080 resolution. That is a full 31% better than with the Radeon HD 5650, which had to be content with 22.4 fps. 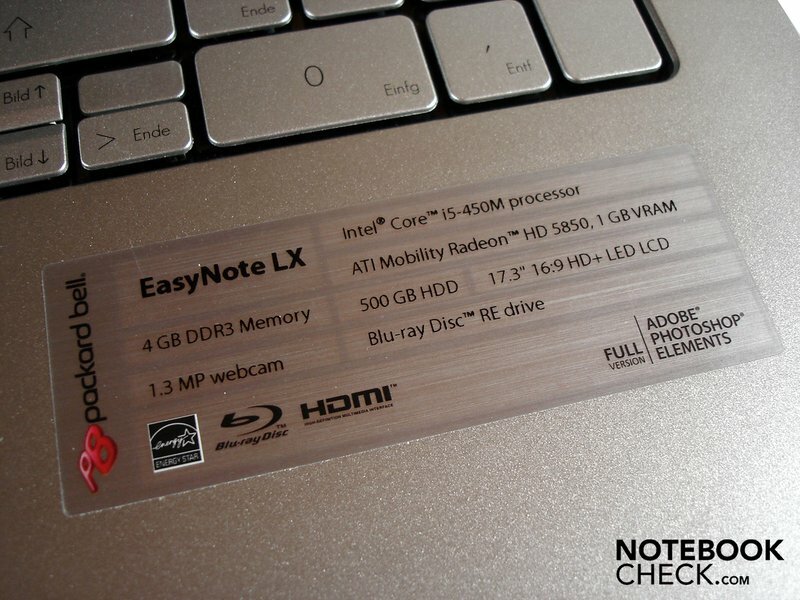 With very high details and a resolution of 1920 x 1080, one is asking a bit too much from the EasyNote LX86. The 19.3 fps which we measured in the intro of the challenge "For the Swarm" indicates that later missions involving even more enemies won't run consistently smooth. Still, compared to the Radeon HD 5650 (16.5), the HD 5850 was still better by 17%. Those who want to play Starcraft 2 in the native resolution of 1600 x 900 without any juttering should in the meantime go for a higher level of details. Low hardware demands are a key feature of the current Fifa offshoot. This has the positive effect of allowing you to try out all the options on the EasyNote LX86. High details and 4x AA in a 1920 x 1080 resolution deliver a butter-smooth 54.9 fps across the display. The Radeon HD 5650 with the same settings also has no problems, as its 45.3 fps guarantee a fluid image refresh rate. The ego-shooter Metro 2033 is the exact opposite of Fifa 11: Due to the extreme demands on the hardware, full-HD resolutions as well as very high details or DirectX 11 mode are taboo. Even with high details and the DirectX 10 mode, Metro 2033 runs far from fluidly in the 1600 x 900 resolution; 17.7 fps speak for themselves. With 14.1 fps, the ego-shooter jerks even more on the Radeon HD 5650, meaning that the Radeon HD 5850 pulls ahead by 26%. While high details and 4x AA appear pleasantly fluidly in the 1366 x 768 resolution (36.9 fps), the EasyNote LX86 is somewhat overextended in the 1920 x 1080 resolution with matching settings: 23.6 fps aren't enough to achieve top times. Here the Radeon HD 5850 outdoes its smaller brother, the HD 5650, by 24%; with 19.0 fps, Shift jerks even more. Those who do without antialiasing can still try their luck in the native resolution of 1600 x 900 on high details. With higher quality settings, the EasyNote LX86 is pushed to its limits by the most popular multi-player shooter. When high details and 4x AA and 8x AF are applied, Bad Company 2 jerks a great deal in the 1920 x 1080 resolution; 17.5 fps are not even close to playable. With a meager 14.9 fps, the Radeon HD 5650 also has nothing to show for itself. Neither GPUs have a chance against high-end graphics cards like the GeForce GTX 460M (~30 fps). You can't really avoid using middle details in the native resolution. In contrast to ego-shooters, roll-playing games are perceived as fluid from the third-person perspective already at 25 pictures per second. While high details and 4x AF in the 1366 x 768 resolution come in just above this value (27.6 fps), one can no longer speak of acceptable game play in a 1920 x 1080 resolution (20.2 fps). With 16.7 fps, Risen jerks even more on the Radeon HD 5650. That means the Radeon HD 5850 has an edge of 21%. For the native resolution, middle details are once again advisable. The engine of Modern Warefare 2 doesn't really belong the freshest out there any longer. With this in mind, its not all that surprising that the EasyNote LX86 in the 1920 x 1080 resolution still gets along reasonably enough even with very high details and 4x AA, though 26.9 fps still is a bit too slow for gaming. The margin of difference to the Radeon HD 5650 is rather small at 26.9 to 23.4 fps (15%). Just as was the case in Shift: As long as one does without antialiasing, high details in the 1600 x 900 ensure decent game play. The EasyNote LX86 makes quite a showing in the integrated benchmark test of the hugely chic racing game Dirt 2. When played with high details, 2x AA and a resolution of 1366 x 768, the Radeon HD 5850 gets for instance to 33.3 fps. The ATI graphics card is too weak however for very high details, 4x AA and a resolution of 1920 x 1080. With 18.3 fps, it's sometimes too difficult to stay on track. The difference between the Radeon HD 5650 is 27% this time, the mid-level GPU gets 14.4 fps. Despite its age of now three years, the ego-shooter Crysis is still a graphic treat. However, in order to run high details fluidly, the resolution must be massively reduced (37.4 fps in 1024 x 768). With very high details and a resolution of 1920 x 1080, the performance of both the Radeon HD 5650 (7.7 fps) and the Radeon HD 5850 (10.2 fps) clearly break down, though the latter still registers a respectable advantage of 32%. For the native resolution, middle details are the right choice. On the whole, the EasyNote LX86 puts up good gaming performance. In the native resolution of 1600 x 900, most middle or high details are possible on current titles, whereby there is still some leeway for quality improvements such as antialiasing. But the Radeon HD 5850 is less suited for higher resolutions in the full-HD realm; the combination of a 128bit memory interface and DDR3-VRAM makes its presence felt too clearly. Depending on the game, the HD 5850 could distance itself - sometimes more, sometimes less - from the Radeon HD 5650. On average, the Radeon HD 5850 was ahead by around 22%. The concluding verdict is as follows: Multimedia enthusiasts with high gaming demands should be thoroughly pleased with the performance of the EasyNote LX86. But, for performance enthusiasts, there's no avoiding true-blue gaming notebooks with high-end graphics cards on the level of the Radeon HD 5870 or the GeForce GTX 460M. One of the biggest strengths of the EasyNote LX86 is its surprisingly low noise development. Under low load (Office, Internet etc. ), only a light rustle can be perceived and the harddrive behaves relatively quietly, apart from some isolated, though in no way annoying, clattering. As the film backdrop is not drowned out by driver noise, nothing stands in the way of a pleasant DVD or Blu-Ray evening. Even under load (3D applications, gaming etc. ), the noise development is fine; the fan always lingers in acceptable ranges. The notebook is only clearly audible under full load, though much of the competition is lenient in this respect. The temperature development impressed us, at least at idle. 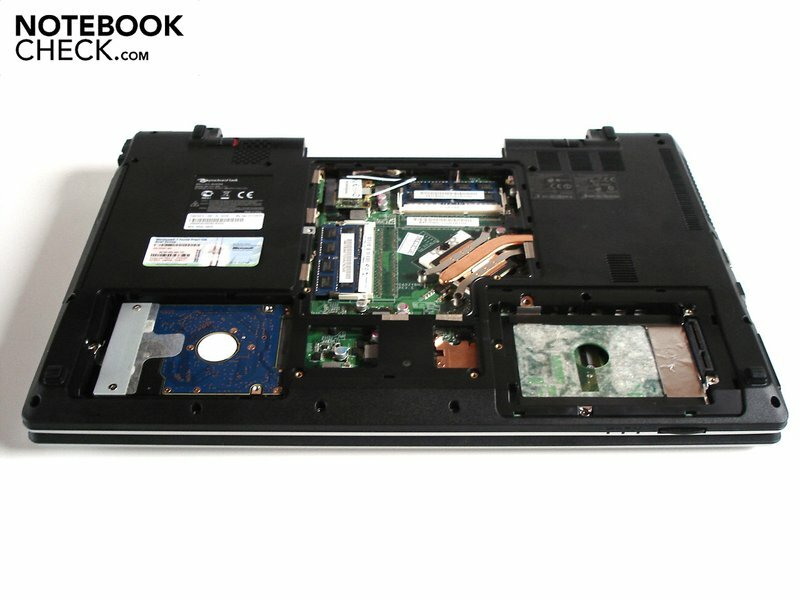 The upper side as well as the underside of the notebook remain under 30°C, which allows one to work very comfortably with the machine. 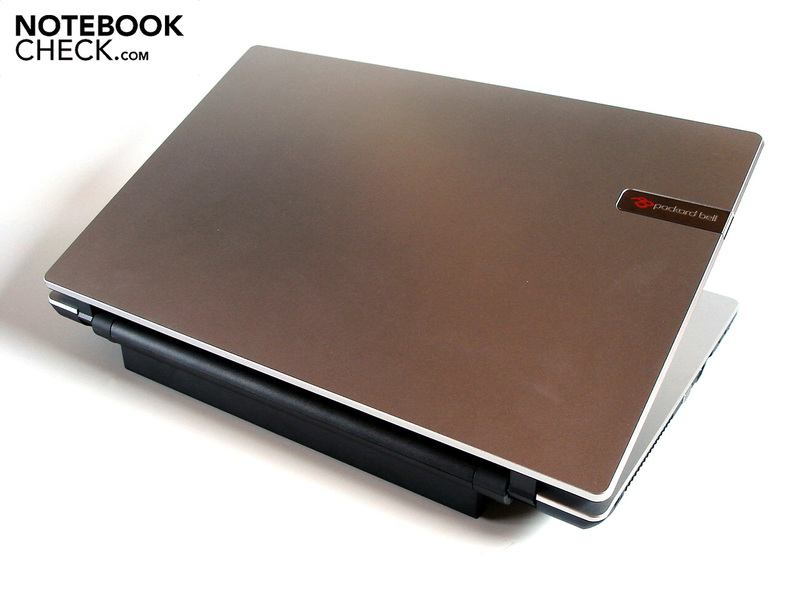 But the notebook gets relatively warm under load, the case's surfaces reach up to 40°C. Though the palm rests prove to be somewhat cooler with a maximum of 35.5°C, a slight warming of the hands could be considered rather unpleasant to those with sensitive natures. But there is no reason to worry about the temperature of the components. While the Core i5-540M and Radeon HD 5850 at idle are very well cooled at 24 and 34°C respectively, there is only a moderate rise in temperature under load of up to 74 and 76°C respectively. 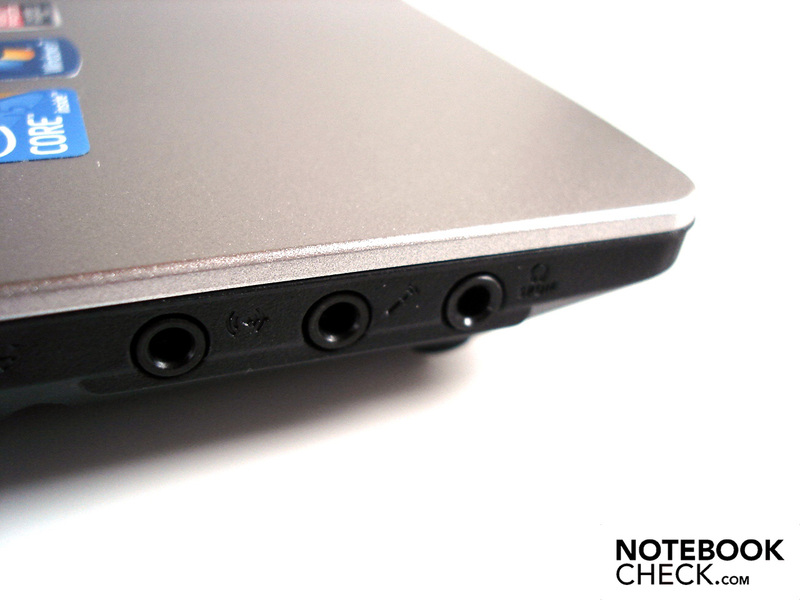 The sound quality of most notebooks is, to put it politely, rather meager. Luckily, the EasyNote LX86 doesn't belong to this group. The built-in loudspeakers offer an above-average sound. All tone areas seem relatively balanced and precise, and there is hardly any distortion even at higher volumes. While the base could certainly afford more push and presence, it is at least there to some extent. 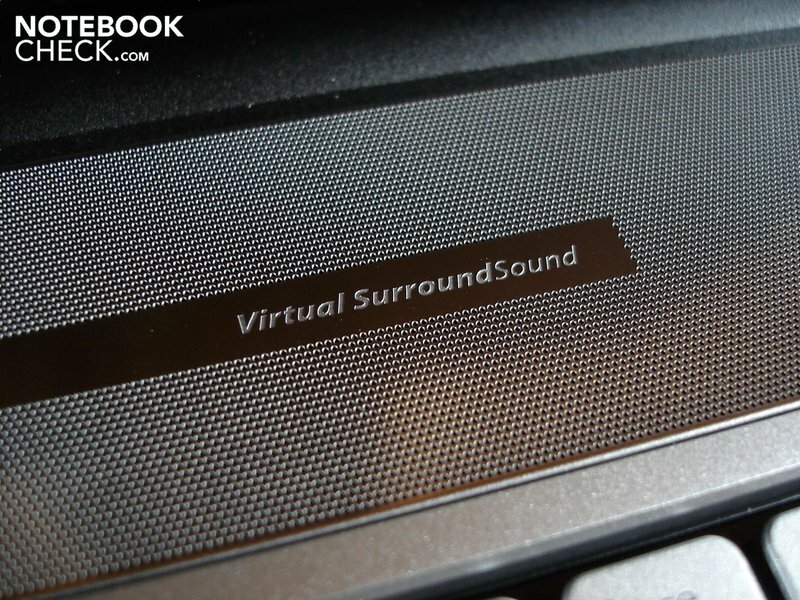 The support of Dolby Home Theater and Virtual Surround Sound represent additional plus points. For the best-possible sound, the "Audio Enhancer" function should definitely be activated in the loudspeaker settings under "Dolby". Overall, an external sound system is not a must, though the somewhat dull sound picture may not be enough for all users. 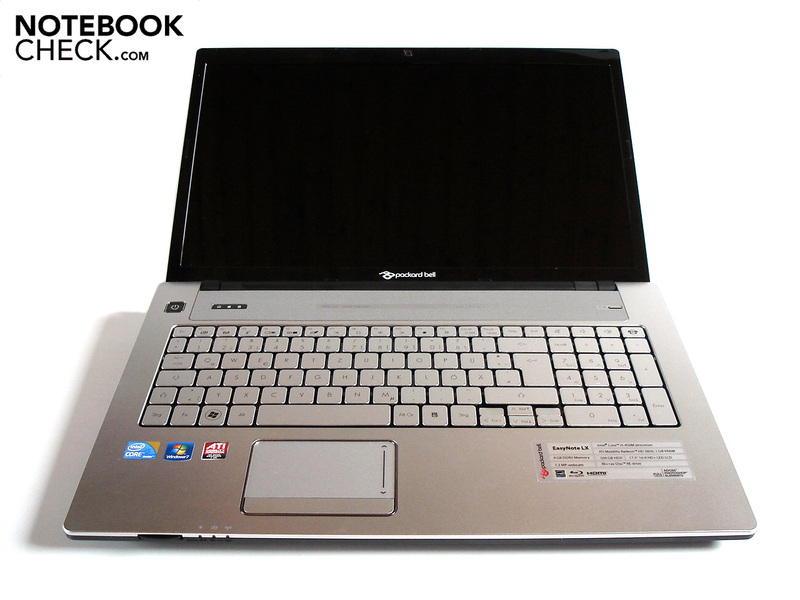 Packard Bell deliveres the EasyNote LX86 with a high-powered nine-cell battery with 99 Wh, which not only raises the rear of the case by around two centimeters, but together with the Switchable-Graphics-Option also guarantees very high levels of mobility. Most outstanding is the runtime at idle: When using the maximum energy-savings option and the minimal brightness level, the notebook ran out of steam only after 13 hours - a TOP value. Those who like to surf the Internet in wireless operation are perfectly served as well; with moderate energy-savings options and maximum brightness, the EasyNote LX86 held out a whole seven hours and 46 minutes. 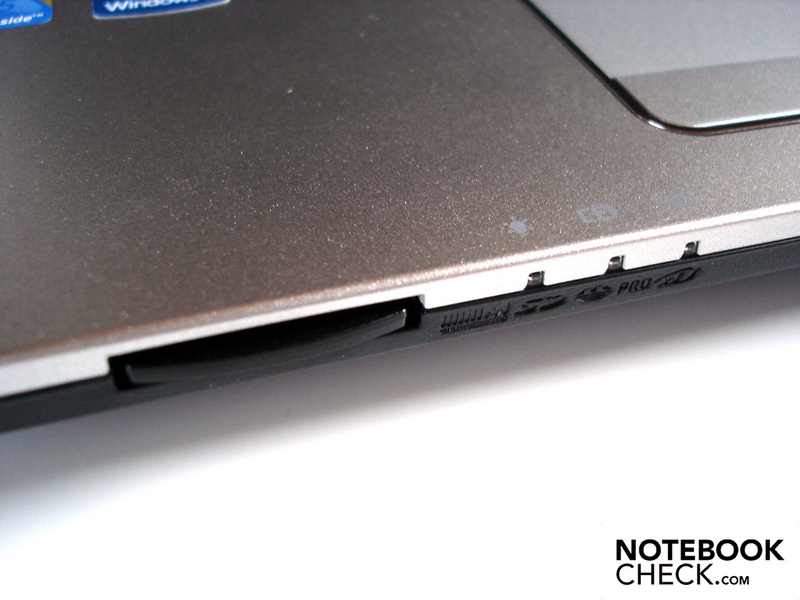 The 17-incher shows no sign of weakness even when playing a DVD; 5.5 hours of film enjoyment remains only a dream for most notebooks. The runtimes are only significantly curtailed under heavy load and with the dedicated graphics card switched on. With maximum brightness and energy-savings mechanisms turned off, we measured 1.5 hours. The current consumption is more than respectable considering the performance available. 9.2 - 16.3 watts at idle and 63.7 - 84.9 watts under load are under that of some 17-inchers which have to make do with weaker graphics cards (see for ex. Dell Studio 1749). 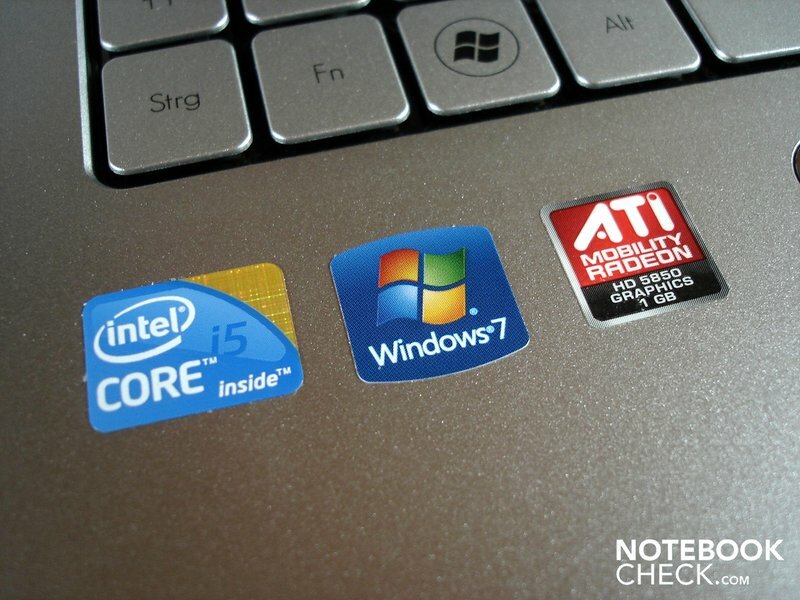 There are no real surprises when comparing it to the cogeneric Acer Aspire 7745G as both notebooks allow themselves (up to standby mode) similar amounts of energy. 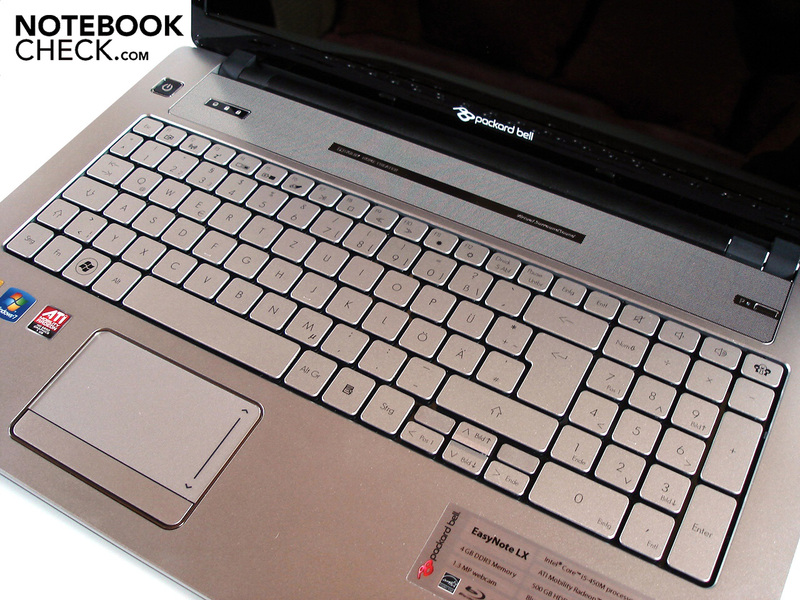 If one considers all the individual aspects together, it can be said that Packard Bell has offered an exceptionally interesting and thoroughly successful multimedia notebook with the EasyNote LX86. Not least thanks to the matte-silver surfaces, the 17-incher impresses with a chic look. The high-quality impression is underlined by its fine finish. The performance has nothing to hide at a price of just under 1000 Euro; Core i5-540M and Radeon HD 5850 are also up to demanding tasks. Adding to that is an astoundingly high battery life, which is realized with help from a potent battery and the option of switching between the integrated and the dedicated graphics units (Switchable Graphics). The moderate noise development was also a pleasant surprise. 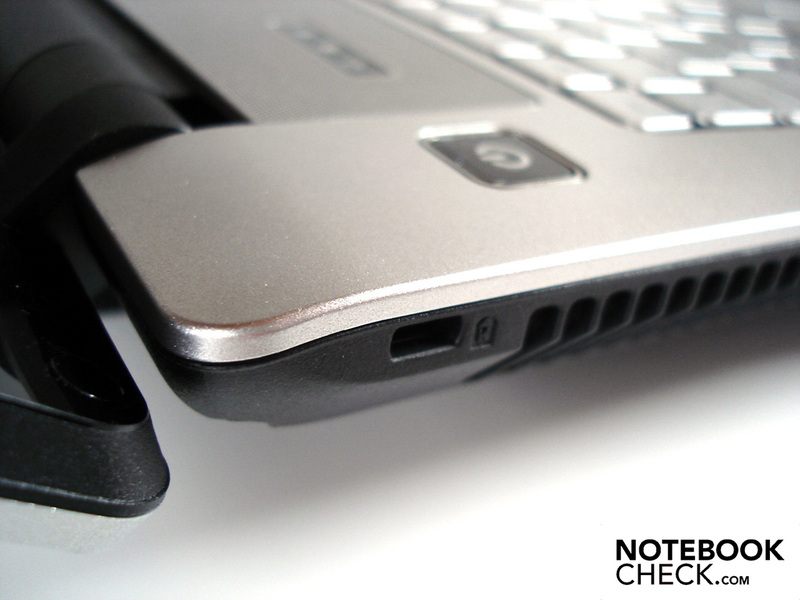 Even under load, the notebook doesn't get too loud. 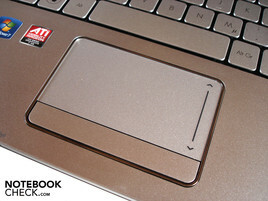 A unique characteristic is also the thoroughly solid touchpad as there is hardly any product from the competition which allows for such pleasant gliding across its surface. Foremost among the negative points is the mediocre display quality. Be it the level of black, contrast or viewing angles, just about every area is dearly in need of improvement. We were also disapointed with the connection equipment. Packard Bell went without numerous connection options such as eSATA and Firewire. The somewhat lacking stability of the case as well as the fairly spongy keyboard are further points of critique for the multimedia notebook. All in all, the EasyNote LX86 earned a bonafide rating of 84%. The individual weaknesses are more than made up by the dozens of strengths. Those looking for a 17" multimedia platform with a high level mobility at cost-effective price, and whose demands in terms of the display or connection equipment aren't all too high can promptly reach for the EasyNote LX86. A 90 watt power pack is enough for the potent hardware. Other manufacturers should take cues from the outstanding touchpad. 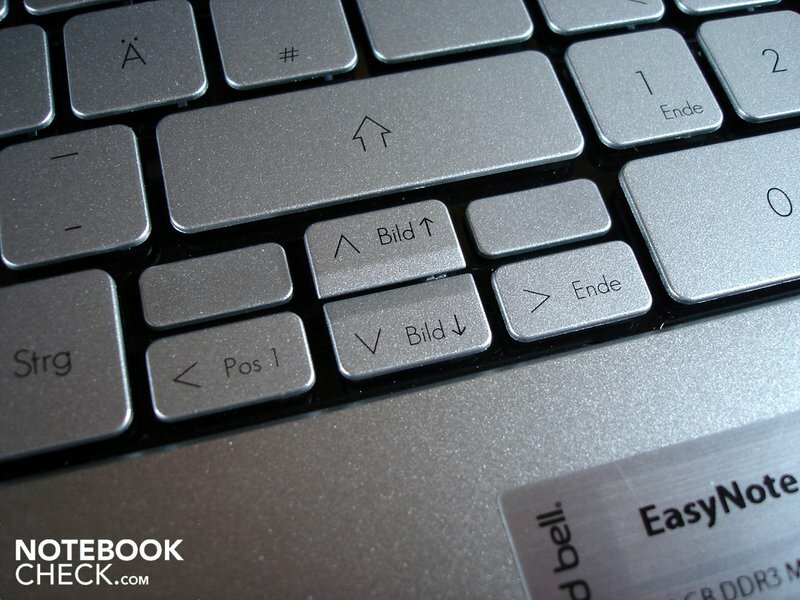 A sticker reveals diverse specifications. ATI's Mobility Radeon HD 5850 is an upper mid-level graphics card. Numerous details provide nice accents. 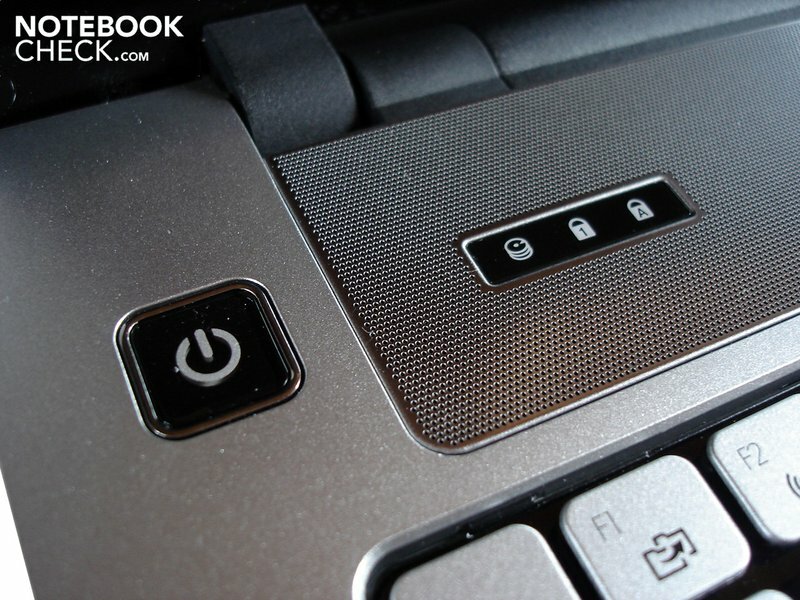 The P-key activates the PowerSave-mode. 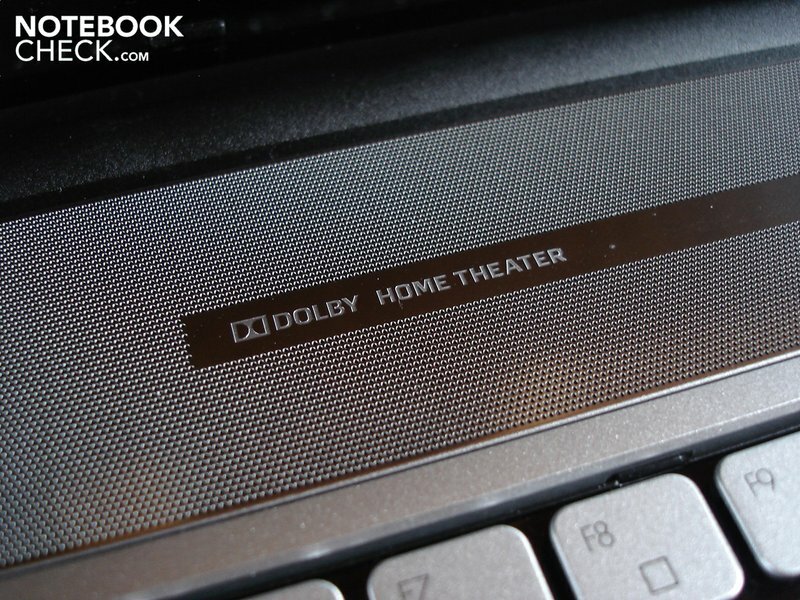 The notebook supports Dolby Home Theater and Virtual Surround Sound. With the exception of the arrow keys, the size of the keys is absolutely fine. The sound quality offered is above-average good. The typing feel of the keyboard is somewhat spongy. On the front side is a Multi-in-1-cardreader. 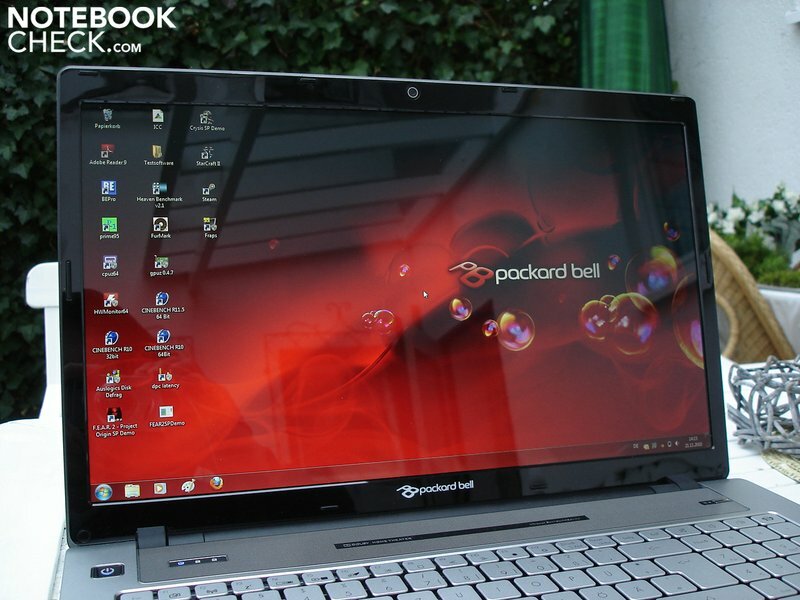 Packard Bell did without USB 3.0 ports. Packard Bell is generous with the accessories. The package is right at home underneath the Christmas tree. 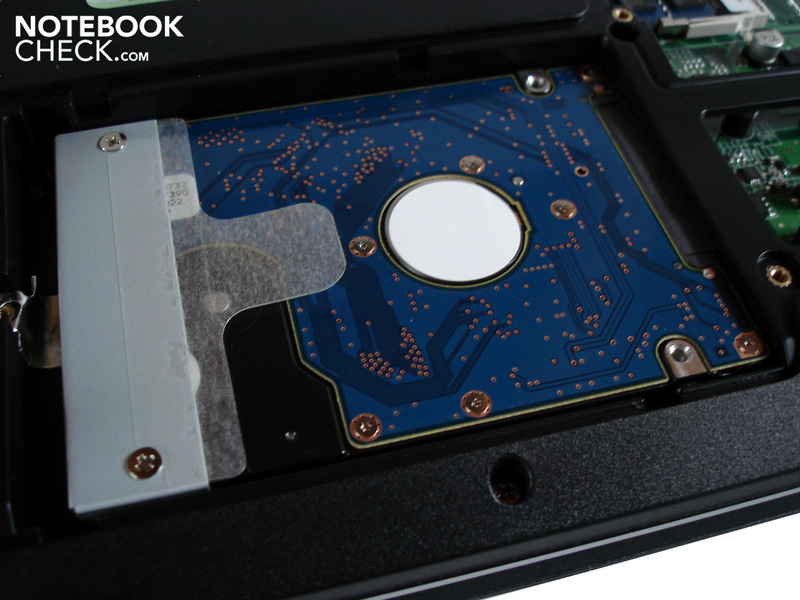 The harddrive can be changed out without any problem. The sound connection round off the left side. 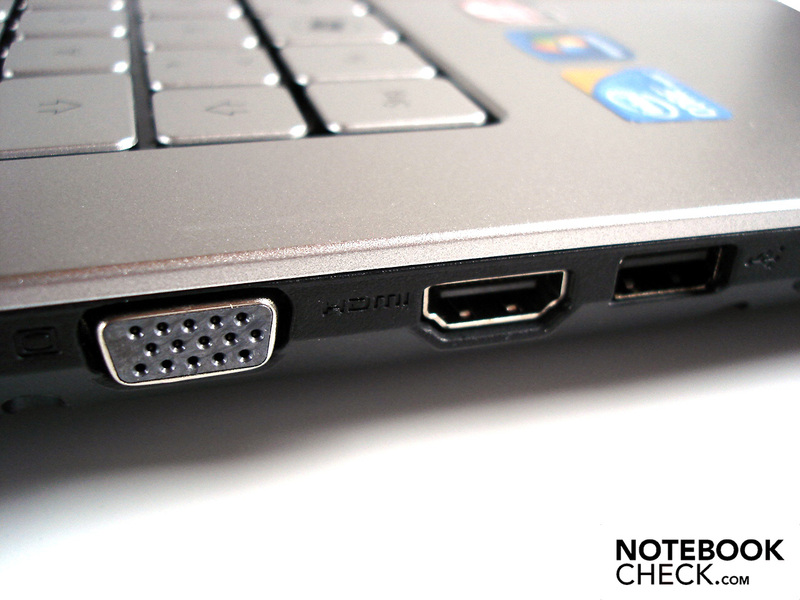 External monitors can be hooked up with help of VGA- and HDMI ports. Just about every notebook has a Kensington Lock. Gigabit-LAN ensures fast data transfer. Film enthusiasts will be happy about the integrated Blu-Ray driver. There is little room for critique in terms of its finish. It of course shouldn't be without a company logo. Two access covers can be removed from the underside. 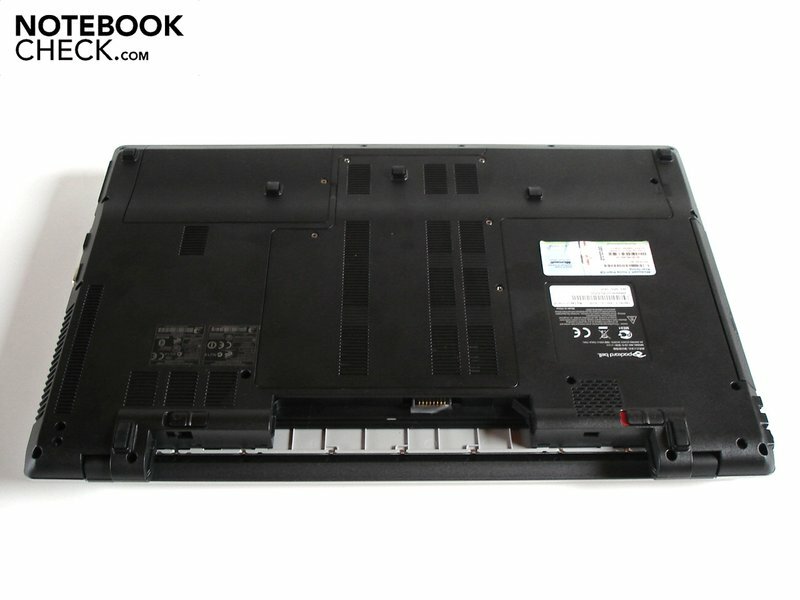 The chassis is for the most part like that of the Acer Aspire 7745G. Many connections sit quite far forward. 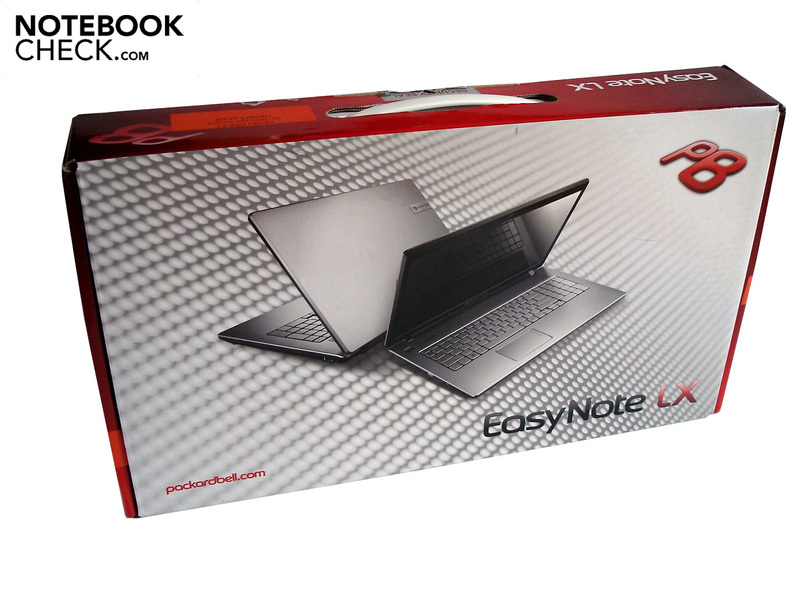 At around 3.1 kg, the EasyNote LX86 is still reasonably transportable. The connection equipment is rather meager for a multimedia notebook. The design can be described as successful. The maximum opening angle is impressive. The matte-silver surfaces are relatively hard-wearing. Apart from the graphics card, all important components are accessible. 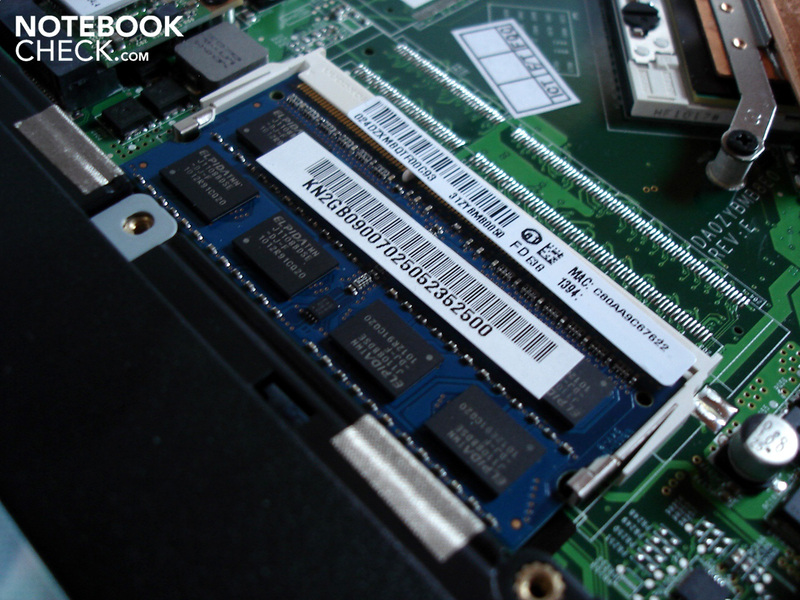 A fast DDR3-RAM serves as the main memory. 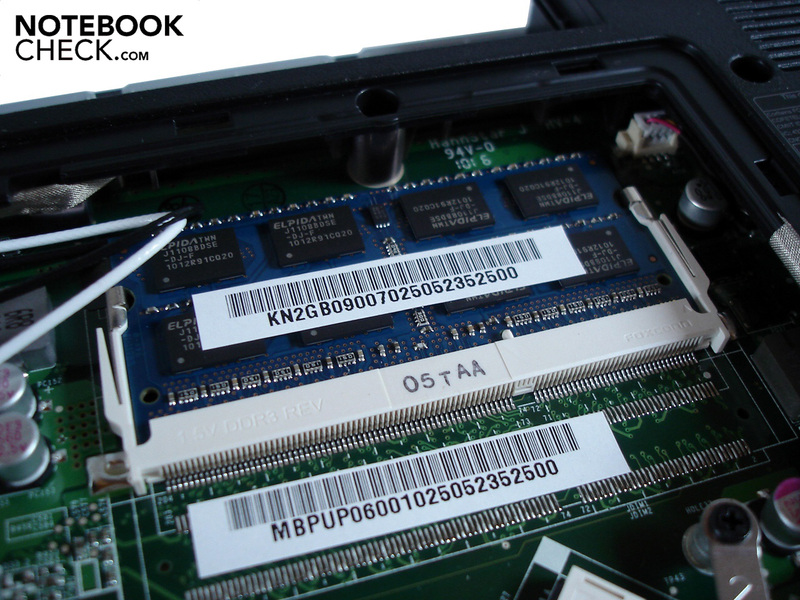 Four GB RAM (2x 2048 MB) are already built-in. The integrated webcam has a resolution of 1.3 megapixels. The case's stability leaves a bit to be desired. 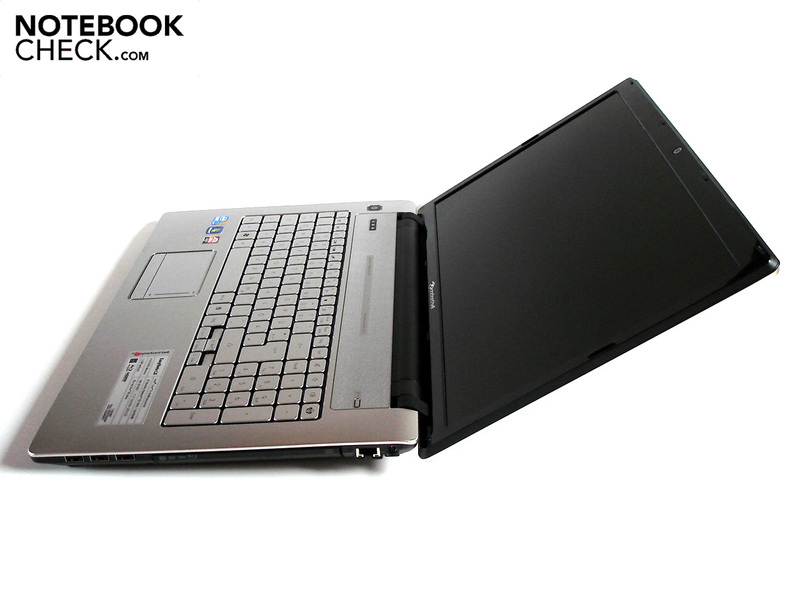 The notebook becomes much lighter without the battery. The high-powered 9-cell battery ensures extremely good runtimes. 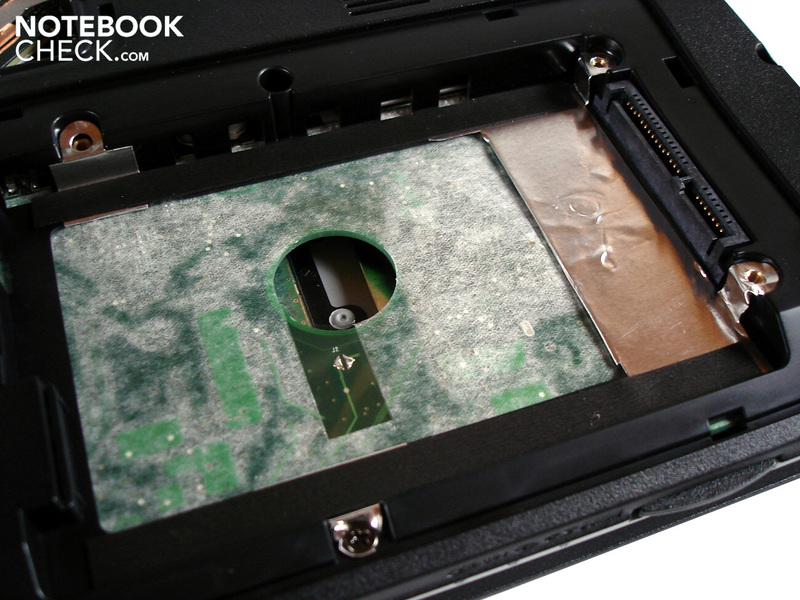 Theoretically, the case has a second harddrive slot. The 320 GB HDD offers decent performance. WLAN and Bluetooth enable wireless communication. Intel's Core i5-450M processor works nice and quick. The EasyNote LX86 is kept in the aluminum look. The noise development is never too high, even under load. Further positives are the integrated Blu-Ray burner and the outstanding touchpad. Above all a better-contrasting display with better viewing angles. More generous connection equipment and a more stable keyboard also wouldn't be bad. Thanks to the potent battery and switchable graphics card, the battery runtimes are extremely high. Under optimum conditions, far more than 10 hours are possible. 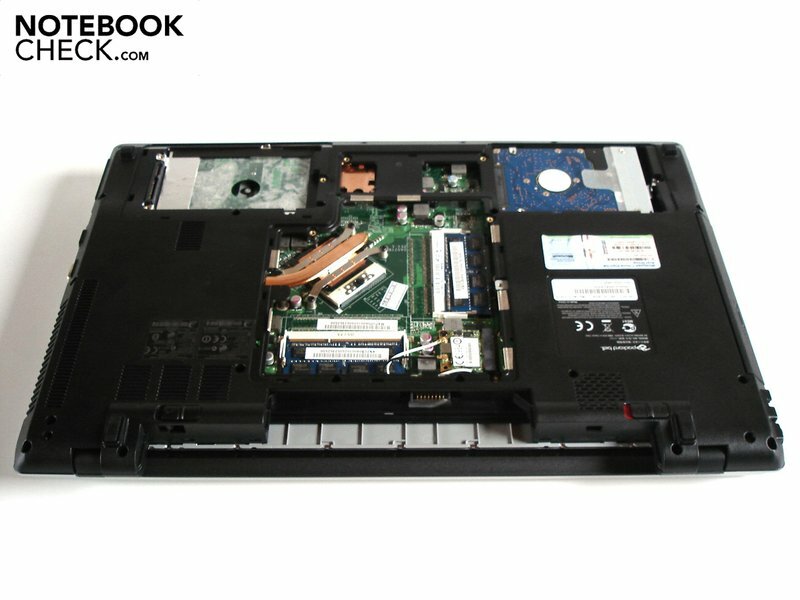 17" notebooks with decent power under the hood such as the Acer Aspire 7745G, the Acer TravelMate 7740G or the Dell Studio 1749.